As a Moragan who has spent his career in business, I write to enthusiastically endorse and encourage my fellow Moraga and Orinda citizens to vote for Red Smith and Nathan Bell for the MOFD Board of Directors. The MOFD was established 21 years ago with a board of directors to be made up of community citizens; the very individuals that finance, through their tax dollars, the MOFD. I have known both Red and Nathan for decades, as well as their families, and can vouch for their personal integrity, character, love of our community and professionalism. They hold MBAs from Harvard and Cal and are both endorsed by Senator Steve Glazer. I'm troubled at the notion of the board being populated with their opponents, individuals from the very same union and community which the board is designed to supervise. It strikes me somewhat as a conflict of interest. In any case, the $70+ million pension deficit that has accrued over the life of the MOFD is a serious matter as highlighted by the Editorial Page of the East Bay Times in its endorsement of each candidate. It stated that the deficit exceeds $5,000 per household in the Moraga-Orinda Fire District. It would be irresponsible to pass this burden onto the next generation. Join me in doing the right thing for our community and vote for Nathan Bell and Red Smith! We have known Michael for over 10 years and have seen him work in numerous volunteer capacities. When we first met him, he was making sure our family had a plan for fire evacuation in our home and what we should do when we traveled. Some examples of his community involvement are: visiting kids classes and educating our youth on fire safety, managing Glorietta Elementary’s Emergency Response shelter and the Great ShakeOut earthquake drills. He has also worked as a coach, and a board member of the non-profit, Random Acts, for over 14 years. I am writing in support of Michael Donner for the MOFD Board of Director seat in Division 4. I have known Michael for 15 years since my son was in kindergarten with his son. He has been involved in the community and has done everything from creating and painting Glorietta Gopher yard signs to serving pizza for our firefighters during the Ghost Ship fire and clean-up. Michael has served his entire career as a firefighter for the Oakland Fire Department. Over the years, Michael has become very passionate about emergency preparedness in our community. Throughout his 30-plus year career he has been to many major disasters. After returning from New York for 911, hurricane Katrina in Louisiana and the Loma Prieta Earthquake he realized there was an information void in Orinda. He worked with local schools to store emergency supplies. He collaborated with FEMA professionals to speak to the community on how to prepare for disaster. Michael is a positive, passionate and motivated person that gets things done. He will make sound decisions and bring much needed fire experience to the board. Based on Michael’s extensive experience in the fire service, his years of volunteering to prepare our community for a disaster and his dedication to the community, there is no doubt that he is the best choice for the job. Please join me in voting Michael Donner to the MOFD Division 4 Board of Director seat! Please join me in voting for Amy Worth for Orinda City Council on November 6, 2018. I had the pleasure of serving with Amy on the Orinda City Council, and I know her to be smart, thoughtful, respectful and a problem-solver. From planning new playing fields and tot lots, to providing books and supplies for Orinda’s fine public library, to working with our schools to support student safety, to fixing Orinda’s roads and storm drains, Amy has worked tirelessly to enhance our civic life in Orinda. Amy also works for Orindans at the regional level, ensuring that we receive excellent recycling and garbage services, and that scarce State and Federal transportation dollars are allocated to meet our transportation needs. It is due to Amy’s strong advocacy that the fourth bore of the Caldecott Tunnel was built to increase our safety and ease our commutes! Please vote for Amy Worth for Orinda City Council so that she can continue to serve our community. I write to express my concern about the current elections in which firemen union members or their representatives are running for the Board of MOFD. While I deeply appreciate the honorable, even lifesaving work that our firefighters perform in our community, it strikes me as a significant conflict of interest that firefighters would populate the board of directors charged with overseeing the firefighters. As a professional in the financial services industry, I work with numerous corporations, and such a conflict of interest would never be allowed in the private sector. I've known Red Smith and his family for 17 years. Red coached my kids in the Moraga Baseball League, and our children went from Kindergarten through High School together. I know Mr. Bell and his family by reputation as our children attended Campolindo High School together. More recently I've gotten to know his background, experience in the business world, and his guiding principles for the MOFD. I understand they are both endorsed by Senator Steve Glazer and three of the current MOFD Board members. While both of these men have impressive credentials (MBAs from Cal and Harvard), maybe the most important title they can carry in this election is independent tax-paying private citizen. These gentlemen are concerned citizens with the desire and business savvy necessary to balance the interests of the firefighters with the interests of the Moraga-Orinda Community while responsibly guiding the MOFD towards fiscal stability. I urge my neighbors to vote as I will this election season, and that is to vote for independent citizens for the board of the Moraga-Orinda Fire District: Mr. Red Smith and Mr. Nathan Bell. The MOFD is technically insolvent. It has unfunded retirement liabilities of $62 million, about $5,000 per family served. If not fixed, the MOFD will eventually go bankrupt and our fire service cut severely. The MOFD put our fire protection in grave danger on December 9, 2003 when it signed a contract giving firefighters unsustainable retirement benefits. For the next 13 years the union ran the show. Alarmed, the community finally elected enough strong and astute board members who have begun to lead us away from a looming fire protection Armageddon. Now is not the time to turn back. We need strong determined savvy leadership. Fortunately, Lucy Talbot is the District 2 candidate. I have known Lucy Talbot and have worked with her on various community projects in Orinda for 26 years. She is a pillar of the community. She is open minded, passionate and tireless. She is very knowledgeable about fire department operations from her experience as a Motorola sales executive. She has extensive and hands on financial xpertise from her 33 years’ experience running a family business. She is devoted to Orinda. Vote to save our fire protection. I heartily endorse Steve Danziger for Moraga-Orinda Fire District 3. I’ve known Steve since he was Scoutmaster of my son’s troop 16 years ago. Steve is genuine, honest and extremely capable with a great sense of humor. He has over 20 years of public service experience, including as an Administrative Manager with the Oakland Fire Department, and has the knowledge and the background to hit the ground running. His goals include, but are not limited to, maintaining and enhancing fire safety, being fiscally responsible and accountable and strengthening relationships with the staff and the community. He will bring a knowledge, passion and experience that will help guide MOFD into the future. If you are in District 3, I urge you to vote for Steve Danziger on or before November 6th. Thank you, Lafayette residents, for electing me to the City Council since 1985. After 33 years, I am looking forward to retirement. Lafayette remains a community to which people want to move and then want to stay. That success occurs partially because residents elect responsible city council and school board members. After meeting five candidates for two City Council seats, I support Karen Maggio and Teresa Gerringer. Both accomplished women bring the skills, personality and work ethic Lafayette needs. Their experience and integrity are required to lead Lafayette in changing times. Karen served for 10 years on Lafayette’s Planning Commission and her career focuses on planning. Teresa is finishing 19 years on the Lafayette School Board and brings unparalleled access to the state legislature. The integrity of both women is above reproach. Karen and Teresa have a track record of improving Lafayette. As examples, Teresa was instrumental to the development of the library. Karen worked hard to create our general plan and ridgeline preservation ordinance and helped define what our library would contain. Both raised families and volunteered in other areas. Teresa and Karen make alliances that enable progress. Like it or not, regional and state forces are pressing Lafayette to change and an ability to engage and form alliances can advance Lafayette’s interests better than does rigidity. Both are fiscally responsible. Karen has managed multi-million-dollar budgets successfully at Mills College and the San Francisco Presidio. Teresa has done an outstanding job managing the fiscal challenges facing the Lafayette School District given the restrictions imposed by state funding. The School District is outstanding. Most new residents move here because of our schools. That improves everyone’s real estate values. Neither has conflicts of interest. Lafayette faces important issues including the application for the Terraces at Deer Hill and pipeline safety discussions with PG&E. You deserve to be served by council members who can participate in these important decisions. Unlike others, Teresa and Karen do not need to recuse themselves. Please join me in voting for Karen Maggio and Teresa Gerringer for Lafayette City Council. I have the pleasure of writing to support the re-election of Steve Anderson as a Director of the Moraga-Orinda Fire District from voting Division 3 of the District. I served with Steve on the Fire District Board for four years. Steve always put the interests and safety of the residents of the District above all other considerations. He was exceptionally well prepared at every meeting. He consistently applies his decades of experience as a businessman to the issues of the District, making it clear that he expects value for taxpayer dollars. When Steve was President of the Board, he conducted every meeting with courtesy and respect for every visitor to our meetings and showed genuine interest in what they would say. In dealing with differing views of Board members, he worked hard every time to reach a consensus. After the coming election, no Board member will have more than two years of experience and at least two will have none. It is important to maintain continuity in the District, and Steve's intelligence, integrity and respect for others make him the right person at the right time to be re-elected to another four year term as a Director of the Fire District. I urge everyone in voting Division 3 of the Fire District to vote for Steve. Marvin Gaye and Kim Weston rode a popular wave with their hit tune,” It Takes Two!”. So goes the upcoming election for Orinda City Council, with candidates Eve Phillips and Kathleen Jenkins. How do you know if Ms Phillips and Ms Jenkins deserve your vote? Do you believe, that all things considered, Orinda is a pretty darn nice place to live and is worth defending? 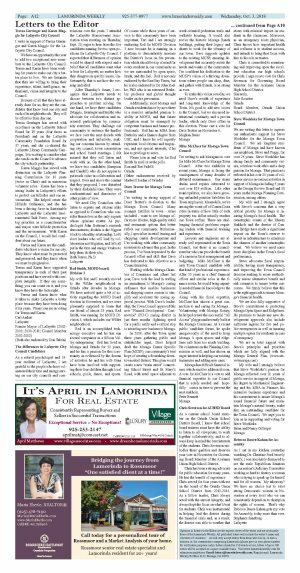 Do you prefer council members who consistently seek to get input, directly from you, Orinda citizens, on important matters, rather than self-determining what is best for you? Do you prefer that your council members have no ties to the always-lurking, real estate development industry? Do you prefer council members who question awarding a succession of city contracts to consultants, which never seem to result in any positive results for Orinda citizens? Do you prefer council members with successful experience in crisis management? Do you prefer council members who understand the link between city council decision-making and the sustained quality of Orinda schools? Do you prefer council members who advocate BART’s obligation to provide adequate parking capacity for their Orinda customers? Do you prefer strong council members committed to local control of land use and zoning matters, who are independent of and willing to stand up to the outsiders, who seek to determine Orinda’s future? Vote Eve Phillips and Kathleen Jenkins. I write in support of Teresa Gerringer and Karen Maggio for the Lafayette City Council. 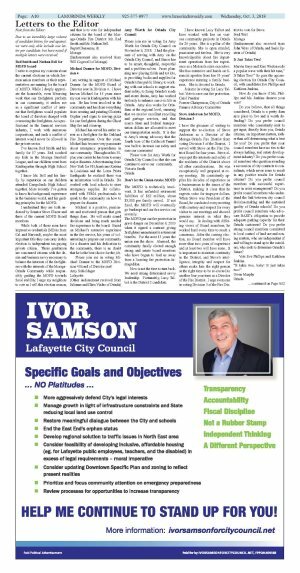 We have an opportunity this year to add two exceptional new members to the Lafayette City Council. Teresa and Karen have been working for years to make our city a better place to live. We are fortunate that they are willing to bring their experience, talent, intelligence, enthusiasm, vision and integrity to the Council. Because of all that they have already done for us, they are the candidates that know best our city and each of its neighborhoods. They will be effective from day one. Teresa Gerringer has served with excellence on the Lafayette School Board for 19 years (four times as President) and on the Lafayette Community Foundation Board for 17 years, and she co-chaired the Lafayette Library Community Campaign. It is exciting to consider what she can do on the Council to advance the city-schools partnership. Karen Maggio has served with distinction on the Lafayette Planning Commission for 10 years (twice as Chair) and in numerous volunteer roles. Karen has been a strong leader in Lafayette’s efforts to protect our hillsides and our environment. She helped create the Hillside Ordinance, and she has been a driving force in Sustainable Lafayette and the Lafayette Environmental Task Force. Among my top priorities as a councilmember and mayor were hillside protection and the environment. With Karen on the Council, I would feel confident about our future. Teresa and Karen are the candidates who have a vision for our city. They know what must be protected and preserved, and they know when we must be progressive. Teresa and Karen have supported transparency in each of their past positions and have served with complete integrity. If they say something, you can count on it, and you know they have the facts right. Teresa and Karen know what it takes to make Lafayette a better place because they have been doing it for years. Please join me in voting for Teresa and Karen. As a retired psychologist and 33-year resident of Lafayette, I am grateful to the people who have volunteered their time and energy serving on our city councils and commissions over the years. I attended the Lafayette Homeowners Association town meeting on Thursday, September 20, eager to hear from the 5 candidates running for 2 open positions for Lafayette City Council. I expected that differences of opinion would be shared with respect and a belief that all candidates want what is best for Lafayette, no matter how they disagree on specific issues. Unfortunately, that is not how the evening unfolded. After Thursday’s forum, I recognize that Lafayette needs to choose between two distinct approaches to problem solving. On one hand, we have three candidates (Maggio, Gerringer and Smith) who advocate for collaboration and increased participation by community members. They challenge our community to embrace the hurdles we face over the next decade with cooperation and inclusivity, making our concerns known by attending city council, town commission and school board meetings. I felt assured that they will listen and work with us. On the other hand, we have two candidates (Sampson and Candell) who do not appear to put much value in collaboration and respect. Over and above the content that they proposed, I was disturbed by their disdainful tone. They were confrontational and dismissive of other points of view. We need City Councilors who listen to experts and citizens alike as opposed to Councilors who consider themselves as the only experts whose opinions matter. As psychologist John Gottman’s research demonstrates, disdain is the biggest block to a healthy relationship. Let’s elect leaders who will lead by collaboration not litigation, and let’s all put in the time and energy it takes to help them do their jobs. Steve Anderson is a critical element of the MOFD Board where he has served the community for 6 years. He is smart, does his homework studying the issues, asking good questions, getting the answers and developing policy that works. I served on the MOFD Board for 17 years and during that time worked with several different boards. We didn’t always agree, but worked together to develop and deliver a very high level of service professionally delivered both in the field and at the Board. In my time with Steve on the Board, he demonstrated all the best attributes and it was a pleasure to work with him. The current environment on the Board is troubling. I am afraid the high level of service the District has provided is at risk by a Board that does not look to balance budget and service. Steve’s leadership is needed for the Board to provide the stability, history, work ethic and direction that will best serve our community. Please join with me to support Steve Anderson for Director of Division 3 of your MOFD. My wife Teri and I recently moved to the Wilder neighborhood in Orinda after decades in Moraga. We have noticed quite a bit of activity regarding the MOFD Board election in November, and we were pleasantly surprised to learn that our friend of almost 25 years, Red Smith, was running for MOFD Division 3 which includes our Wilder neighborhood. Red is an accomplished technology executive and he has run several companies as a Silicon Valley entrepreneur. Red has lived in Moraga and Orinda for 30 years, and he has a passion for this community as evidenced by the dozens of activities he and his wife Gina have been involved with supporting their four children through local schools, pools, dance, and sports. Of course while those years of service to this community have been important, Teri and I are strongly endorsing Red for MOFD Division 3 now because he is running on a platform to demonstrably increase the District’s focus on fire prevention which should be top of mind for every resident in our community as we are surrounded by open space, brush, and dry fuel. Red is not only endorsed by the East Bay Times, but he is also endorsed by Dr. John Radke, PhD who is an esteemed Berkeley professor and global thought leader on fire prevention. Additionally, most Moraga and Orinda residents know by now there is a massive unfunded pension liability at MOFD, and that future obligation must be managed by competent business and finance professionals. Red has an MBA from Berkeley and a finance degree from USC, and I know he will expertly represent local citizens and taxpayers, and not special interests, if he has to privilege to serve. Please join us and vote for Red Smith by mail or at the polls. I have seen all of the campaign signs around town, and I am struck at the number of candidates for the MOFD Board. I have looked into the election situation, and I was surprised to learn that there are three contested races, each with an active or retired fire fighter running for one of the open Board seats. Frankly, I am unclear how that can happen as it doesn’t seem appropriate to have people working for a fire district, or drawing a pension from a fire district, actually on a Board managing a fire district. That notwithstanding, when I dug deeper, I also learned that there’s an approximate $70m unfunded pension liability—just for Moraga and Orinda—and, as local taxpayers absorbing that massive future obligation, I find that unacceptable. I now know that besides the active and retired fire fighter candidates, there is also an alternative slate of independent business professionals that are seeking office with the stated goal of beginning the process to reduce the unfunded pension liabilities on behalf of all taxpaying citizens. I would like to be clear, I am not anti-union; however, I am anti-bankruptcy, so I endorse the slate of capable finance professionals that have managed annual budgets well in excess of MOFD’s $25m in taxpayer provided funds: Nate Bell for MOFD Division 1 in South Moraga, Lucy Talbot for MOFD Division 4 in Central Orinda, and Red Smith for MOFD Division 3 in West Orinda/West Moraga. My family has known Red for over 5 years, and we can’t think of a more competent and passionate resident to represent the taxpayers that fund MOFD. I'm writing in strong support of Dave Trotter's re-election to the Moraga Town Council. Many younger families in town - mine included - want to see Moraga offer more diverse, high-quality retail and restaurant options that better reflect our community. Professionally, I specialize in retail leasing and shopping center development and I'm working with other community members to advance this goal. In the process, I've been impressed by the focused effort and skill that Dave has dedicated to this objective as a Councilmember. Working with the Moraga Chamber of Commerce and others last year, Dave took the lead in crafting an amendment to Moraga's zoning ordinance that enables businesses and shopping-center owners to simplify and accelerate the zoning approval process. With Dave's leadership, the Town Council approved this new "Planned Development - Commercial" (PD-C) zoning district in just three months -lightning speed for a public entity and a critical step to attracting new business to Moraga. In 2009, after the Town spent three years gathering public and stakeholder input, Dave helped draft the Moraga Center Specific Plan (MCSP), our community's best hope of creating a flourishing downtown retail district. This plan would create a new "main street" connecting School Street and St. Mary's Road, with retail space adjacent to creek-oriented pedestrian trails and walkable housing. It would also revive the historic Moraga Ranch buildings, putting their legacy and charm to work for the vibrancy of our town. Dave supports updates to the existing MCSP, ensuring development that accurately meets the needs and wants of the community. I'm confident his dedication to the MCSP's vision of a thriving downtown where people can shop, dine, and gather with friends, is as strong as ever. To make this vision a reality, we need Dave's wealth of experience and long-term knowledge of the Town. It's good to add new voices to the Council, but we also need institutional continuity and a proven leader, which only Dave offers in this election. Please cast a vote for Dave Trotter on November 6. I’m writing to ask Moragans to vote for Mike McCluer for Moraga Town Council. After two sinkholes in recent years, Moraga is facing the consequences of many decades of deferred maintenance. Our storm drains need repairs estimated to cost over $25 million. Like other municipalities, we also have growing unfunded pension liabilities for Town employees. Meanwhile, we’re among the worst off of Contra Costa cities in terms of how little of each property tax dollar actually reaches our Town coffers. These are challenging financial problems requiring leaders with financial training and experience. Lawyers and engineers are already well represented on the Town Council, but there is no councilmember who can provide the benefit of a career in fiscal management and budgeting. Mike McCluer is the only Town Council candidate with that kind of professional experience. After 30 years as a chief financial officer and similar roles in the finance sector, he would bring urgently needed financial knowledge to the Council. Along with his fiscal expertise, McCluer has shown a great connection to and caring for Moraga . Volunteering with Moraga Rotary, he helped create the successful “All Access” playground recently built at the Moraga Commons. At a recent public candidate forum, he spoke unequivocally of the need to keep Moraga ’s open spaces and ridgelines safe from too much building. He volunteers on the Planning Commission as well, and has shown an eager interest in helping our existing businesses and adding new ones. Moraga has difficult financial issues which must be addressed soon. A vote for McCluer is a vote to add financial expertise to our Council that is sorely needed and—hopefully—comes in time to prevent the next sinkhole. As a current school board member on the Orinda Union School Board, I know that school board trustees must have the ability to listen to all viewpoints, to work together collaboratively, and to always keep in mind the best interests of the students. Chris Severson embodies these qualities and deserves your vote in November for Governing Board Member of the Acalanes Union High School District. Chris has been a strong advocate for public education for many years. He has the benefit of experience — Chris served for four years with me on the board of the Orinda Union School District from 2010-2014. As a fellow trustee, Chris always acted with the utmost integrity, and always kept the focus on what’s best for students. Chris was instrumental in helping lead the district during the financial crisis and, as a result, the district was able to weather that storm with minimal impact on students in the classroom. Moreover, as an emergency room physician, Chris knows how important health and wellness is to student success, and intends to bring that focus with him to his role as trustee. Chris is committed to maintaining and improving upon the excellent education our high schools provide. I urge you to vote for Chris Severson for Governing Board Member for the Acalanes Union High School District. We are writing this letter to express our enthusiastic support for Steve Woehleke for the Moraga Town Council. We are long time residents of Moraga and have known our neighbors, Steve and Peggy for over 25 years. Steve Woehleke has strong family and community values, a tireless work ethic and a deep passion for Moraga. That passion is reflected in his over 20 years of volunteer service in various activities in support of Moraga including 5 years on the Design Review Board and 10 years on the Moraga Planning Commission, among others. My wife and I strongly agree with Steve’s concerns that a very critical priority for Moraga is insuring Moraga’s fiscal health. The catastrophic events of the Rheem Sinkhole and the demise of Canyon Bridge have made a significant impact on the Town’s reserve to invest in infrastructure to minimize the chances of another catastrophic event. We believe we need some more discipline in the Town’s fiscal performance. Steve advocates fiscal responsibility, having more transparency, and improving the Town Council decision making to more methodically assess alternative benefit and risk scenarios to insure better outcomes. We firmly believe that this is the right approach to insure Moraga’s financial health. We are also fully supportive of Steve’s commitment to protecting Moraga Open Space and Ridgelines. He promises to insure any new development approvals also include sufficient ingress for fire and police emergencies as well as insuring multiple egress for residents in case of emergency. My wife and I strongly believe that Steve Woehleke’s passion for Moraga reflected over 20 years of public service in support of Moraga, his degree in Mechanical Engineering and his MBA in Finance, his extensive business experience and his commitment to insure Moraga’s sound financial future and maintain Moraga’s natural beauty, make him an outstanding candidate for the Town Council. We urge you to join us in supporting and voting for Steve Woehleke. As I sat in my kitchen yesterday watching Dr. Christine Ford bravely testify, I was absolutely dismayed to see the male Republican Senators on our nation’s Judiciary Committee working so hard to destroy a woman who is trying to speak up for herself and for all women. My takeaway? We have no choice but to elect strong Democratic women in November at every level who we can consistently depend on to champion the rights of women. That's why Rebecca Bauer-Kahan gets my vote for Assembly, today more than ever.